We’d love your help. 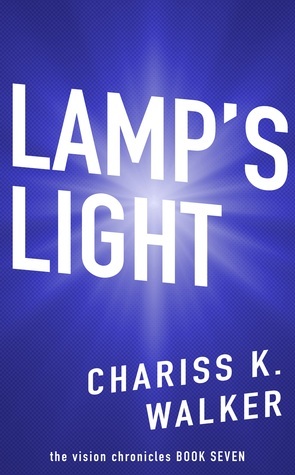 Let us know what’s wrong with this preview of Lamp's Light by Chariss K. Walker. The seventh fast-paced, captivating novel in the Vision Chronicles series by award-winning author Chariss K. Walker continues the story. Now, he sees images of the future through any lamp’s light as it splays across the floor, but each time his ability masterfully changes, there are remarkable consequences, dangers, and side-effects. Like a moth to a flame, he can’t withstand its dangerous temptation or his deep curiosity. In the light, James miraculously visits his ancestors in a faraway secret realm. Can he courageously leave that peaceful place behind and find his way back to the earthly family he loves? With staggering threats on every side, can James protect his new family from those who are still after him? Can he survive this final horrific attack? Lamp’s Light picks up where book six, Stream of Light, left off with the next eight weeks in this uplifting, slice-of-life, paranormal thriller series. To ask other readers questions about Lamp's Light, please sign up. Danger seems to be lurking in every corner--and James is bound and determined to be ready for it when it comes. He is also making sure that all the family are ready. In the Lamp's light he meets up with his dead Mom--a startling occurrence which he doesn't really want to reveal to anyone. This is the second to last book in this series--I will be reading and reviewing Book 8 in a we Danger seems to be lurking in every corner--and James is bound and determined to be ready for it when it comes. He is also making sure that all the family are ready. In the Lamp's light he meets up with his dead Mom--a startling occurrence which he doesn't really want to reveal to anyone. This is the second to last book in this series--I will be reading and reviewing Book 8 in a week or two--watch for it--for the culmination of this intriguing series. This is the 7th book in the series and it is the most scariest because James believes he sees his death in this book. He sees Nate intrude on his home and how he plans to hurt everyone he loves and cares about. I think this is my favorite out of all the books in the series. The Vision Chronicles, Book 7 continues with the birth of the twins. James is totally in love with his wife and newborns. He’ll do anything to protect them, even risk his own life to save theirs. James now sees visions This is the 7th book in the series and it is the most scariest because James believes he sees his death in this book. He sees Nate intrude on his home and how he plans to hurt everyone he loves and cares about. I think this is my favorite out of all the books in the series. This book was filled with action, and a wonderful read. I'm so enjoying the self defense methods they are studying in this series. Characters are well developed and likeable! I wish there was more than one left to read in this series.